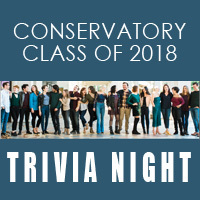 Help us raise funds to send the 20 outstanding senior performance majors to Los Angeles Showcase by showing off your smarts at the Conservatory Class of 2018 Trivia Night, "An Evening in La La Land." The event will be held Saturday, Feb. 3, at 7 p.m. in the East Academic Building's Edward Jones Commons. Doors will open at 6 p.m. Tables are $200 and seat 8. Individual seats are $25. A few tables are still remaining! The first place table will receive a refunded fee. There will also be a 50/50 raffle, table decorating contest, silent auction, and a cash bar. For tickets or to reserve a table, email webcotrivia2018@gmail.com.